Circa 1896. 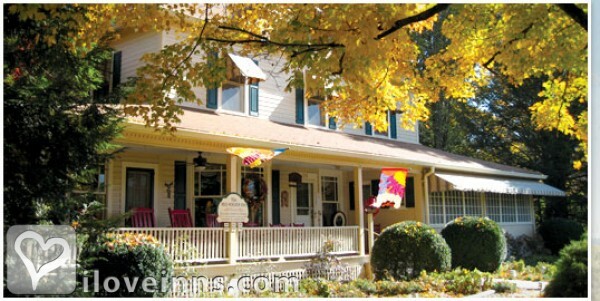 Voted as the best B&B in Asheville, Black Mountain and all of Western North Carolina for the past six years, this three-story inn sits on one acre of pristinely landscaped grounds. Located just 14 miles east of Asheville and the famous Biltmore Estate, discover why the Atlanta Journal named this inn one of its "Top 12 Favorites in the Southeast." Elegant, air-conditioned guest bedrooms exude an inviting ambiance. Many feature fireplaces and whirlpool tubs. Each morning sit down to a heaping Southern breakfast that is sure to satisfy. Stroll through gorgeous gardens with a view of the mountains or relax in front of a roaring fire. 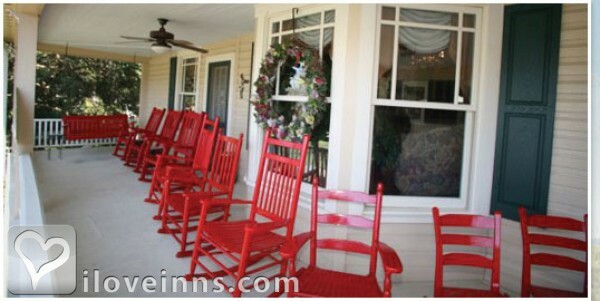 Red rockers line the expansive wraparound porch, a perfect spot to enjoy tea and hand-dipped macaroons. Special dining packages are available year-round which include homemade specialties and award-winning desserts.Publicity and Awards: The Red Rocker Inn is a three-time winner of Southern Living Magazine's "Best 3 Inns in the South" voted by readers choice., WUNCW's popular TV series "North Carolina Weekend".Location: Mountains and Three blocks from downtown Black Mountain. Secluded in a private wing in the quiet of the third floor, the Attic is the largest room in the Inn. At the foot of the King bed are a lovely marble fireplace and a pair of comfy chairs. Skylights, window seat and unobstructed views of the gardens and mountains add to the appeal. The Attic's private bath offers a modern double garden soaking tub and huge walk-in shower. This is the perfect honeymoon location. Brightly lit with skylights and lots of windows, the third-floor Garrett room is elegant and stylish. The romantically draped King bed faces a ambient fireplace. A cozy love seat (which opens to a twin-size bed), old fashioned dressing table and antique armoire furnish the add to your comfort. The spacious private bath has both an old-time clawfoot tub and convenient step-in shower. An ideal location for a couple's retreat, or sleeps three. One of only three rooms located on the third floor, the Blue Ridge room is both private and peaceful. Newly redecorated with its iron King bed dressed in sumptuous deep white comforters and piled with pillows, it is banked by five windows draped in blue and grey toile. It is the perfect spot for quiet rest, conversation and relaxation with an inviting fireplace faced by two cozy chairs . The large tiled private bath has a separate commode and step-in shower, and best of all, a platform whirlpool tub for soaking. Three Mountaineers is a spacious well-furnished bedroom on the second floor with a King bed, fireplace, cozy reading chair and attached private bath. The extra-large bathroom contains a whirlpool tub/shower combination. A perfect room with comfort and a hint of rustic mountain atmosphere. The Old North room is rich with Old World charm and French country decor. 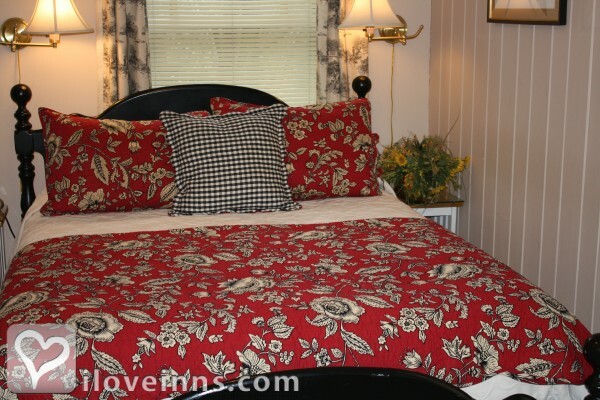 The black Queen bed dressed in beautiful red and black floral and plaid bedding sits across from a red mirrored armoire. The spacious private bath has a whirlpool tub/shower combination and views of the garden. The Dogwood is a bright and cheerful bedroom. A white iron Queen bed with a plush quilt and cozy wingback chair furnish the room. The bathroom is the star of this room with it's extra-large size, old fashion charm and modern comfort. Relax in the antique bathtub or the extra large windowed shower. Reach up to pull the chain on the old fashioned raised-tank commode! 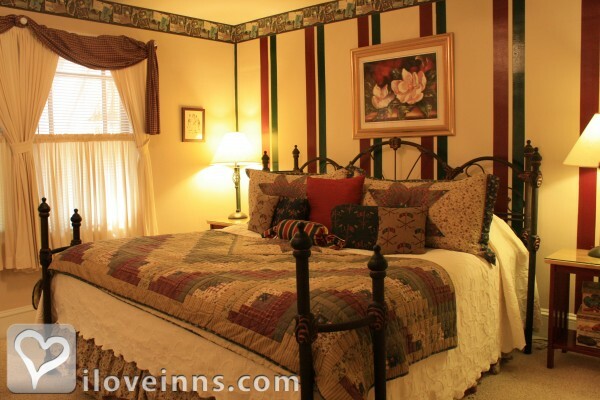 Placed in the quiet rear of the Inn on the second floor, the very spacious Azalea holds a lovely antique dressing table and matching headboard for the Queen bed. Its adjoining alcove with a large bank of windows has both a well-lighted desk and reading couch, which opens to reveal a twin-size bed. The roomy attached private bath contains a tiled tub/shower. Azalea can be linked to Pisgah through the adjoining closet doors. Please add $15 per night for third guest in this room. As the name implies, the elegant Pinehurst room on the second floor is decorated with a subtle golf theme. The spacious bedroom has a beautiful King bed and a roomy private bath with traditional tub/shower combination. Lots of windows for light and a soft reading chair add to the comfort of this room. Primrose room, quietly hidden at the end of the hallway on the second floor, is the most intimate and romantic room in the Inn. A seductively draped two-person whirlpool tub is set adjacent to the Queen bed. The private commode and pedestal sink complete the romantic setting. This is the perfect spot for getting reacquainted with your loved one. Try a touch of the wild - North Carolina style! Located in a quiet corner of the second floor, Pisgah room is a cozy spot with elevated double bed, antique dresser and comfortable reading chair. Attached is a private bath complete with tub/shower. For families traveling together, Pisgah can be linked to the Azalea room through adjoining closet doors. The Music room is conveniently located on the first floor. As its name implies, the bedroom is decorated with music score wallpaper, musical accents and beautiful coordinating draperies over the impressive King bed. A pedestal sink and classic chair and antique armoire finish the room. Private bath has a step-in shower. The first floor Molly Bear room is easily accessed from the parking lot and public areas of the house. Near the draped queen bed is the lighted alcove. with both a love seat for reading (which opens to a twin-size bed) and a handy built-in desk. The bath has a tiled tub/shower. Molly Bear can be linked to Seven Sisters through adjoining closet doors for larger families traveling together. Please add $15 per night for a third person in this room. Highlighted with stained-glass windows and other church accents, the Preacher room is on the first floor in a quiet corner of the Inn. The mission-style Queen bed and soft reading chair are adjacent to a private bath with step-in shower and old fashion corner pedestal sink. 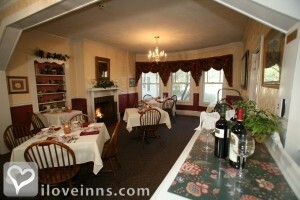 Named for the mountain range visible from the town of Black Mountain, Seven Sisters is a convenient first floor room. It is furnished with a charming brass double bed and a wing back chair. Attached is a private bath complete with tub/shower. Seven Sisters can be linked to Molly Bear room through adjoining closet doors. Payment types accepted include Personal Checks, Travelers Checks, Discover, Master Card, Visa and Cash. 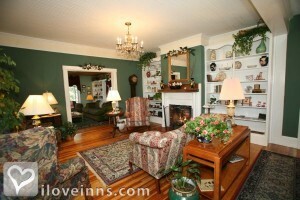 Rooms: This property has 17 total guest accommodations with private bath, 4 with fireplaces, 5 with whirlpools. The types of beds available include Twin, Double, Queen and King. Minimum Stay Requirements: two nights for special rates. Generally two nights on weekends, but that is flexible. Please ask. Pets: Our golden retriever, Jack and stays in the owner's residence or is supervised outdoors. Meals Included in Rates: Breakfast buffet complimentary to house guests, available to others at $13.00 each. Includes egg casseroles, hot baked goods, home made granola, cheese grits, specialty pancakes, French toasts, bacon, sausage, fresh fruit, and other Southern favorites. Types of meals: Afternoon Tea, Restaurant on Premises, Wine, Snacks/Refreshments, Early Coffee/Tea, Gourmet Dinner, Banquet Service, Full Breakfast, Vegetarian Breakfast and Dinner. Amenities In Room: Television, Cable TV, Telephone, Refrigerator, Fireplace, Heating, DVD, Restaurant, Iron/Ironing Board, Bath Amenities, Air Conditioning, Coffeemaker, Wireless Internet Access, Snack Bar, Hair Dryer and In-room safes. Amenities On Site: Fax, Hot Tub/Jetted Tub, Gift Shop, Fireplace, Free parking on premise, Suitable for Events and outdoor gas fire pit. Business Traveler Amenities: Iron/Ironing Board, FAX On-site, Hair Dryer, Flexible Check in/out Times, Internet Access, Daily Newspapers, Gym Nearby, Off-site Dry Cleaning Services, Television and Wireless Internet Access. On-Site Spa Services: Body Scrubs, Facials, Hair Care, Manicures/Pedicures and Massages. Events Hosted: Honeymoons, Romantic Getaways, Meetings, Family Reunions, Seminars, Weddings and Dinner events such as rehearsal dinners. Other Activities: Parks, Museums, Live Theater, Horseback Riding, Hiking, Golf, Fishing, Bicycling, Antiquing, Art Galleries, Shopping (Local Crafts), Skiing Cross Country, Skiing Downhill, Sports Events, Major College, Tennis, Water Sports, White Water rafting, Wineries, Blue Ridge Parkway, Biltmore Estate, Chimney Rock Park, Mount Mitchell, Grandfather Mountain, Cold Mountain, Waterfalls, Mountain hiking, Views, Conference, Retreat Centers, Childrens' Camps, numerous breweries, wineries, food tours and live music. 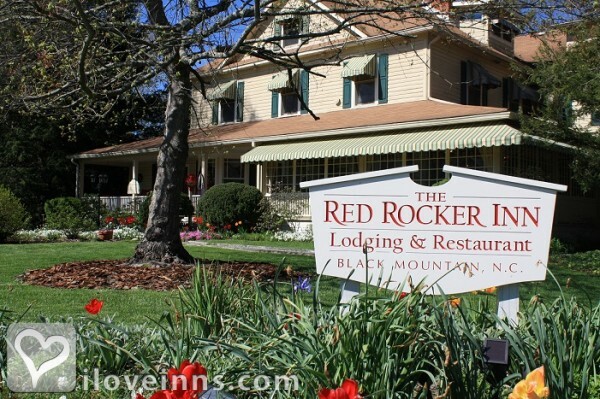 The Red Rocker Inn was built as a family residence in 1896. The family took in boarders beginning about 1905 and it has been a boarding house or inn ever since. Long ago, the house had 26 bedrooms and only 5 bathrooms. Guests would spend the entire summer and eat together at huge tables in the dining room. 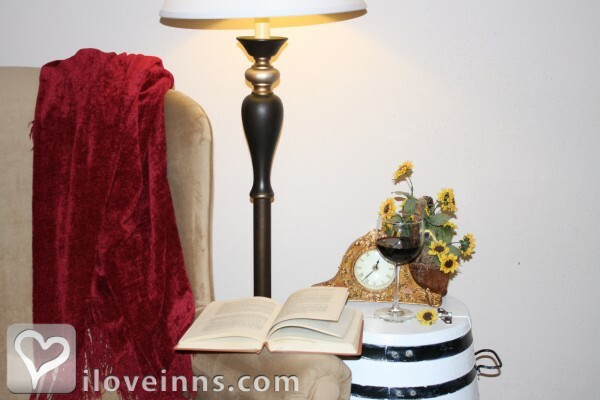 The Red Rocker Inn is perfect for couples who want "alone time" or for the socials who love to make new friends. Our third-floor rooms are especially secluded for the ultimate privacy. Many couples love our oversized showers, king beds and whirlpool tubs.